On the way to becoming the MK VII : Another styling buck fashioned by Abbey Panels men. In 1942, Ted heard of a job at Abbey Panels. 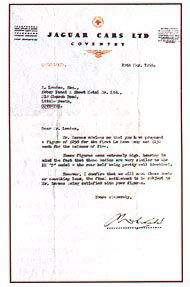 This was a company, in fact, that Ted had been negotiating to start jointly with the proprietor in 1941 but had been advised against because of probable difficulties with the aircraft Inspectorate (a somewhat picky body of men whom Lyons at SS Cars had more than one brush with during the war). 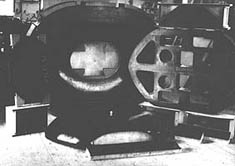 The prototype ‘D’ type. All the ‘C’ and ‘D’ bodies were fashioned by Abbey Panels. brought into it because Sankeys hadn’t made a very good job of the rear end of the saloon Jaguar, in fact it was very poor. Photo: courtesy of Les Savage. One of the original tools for the ‚E’ type bonnet’s nose panel, photographed just after it had been made. Mr. Barnes advises me that you have proposed a figure of £258 for the first Le Mans body and £230 each for the balance of five. These figures are extremely high, bearing in mind the fact that these bodies are very similar to the XK ‚D’ model – the rear half being pretty well identical. However, I confirm that we will meet these costs, or something less, the final settlement to be subject to Mr. Barnes being satisfied with your figures.